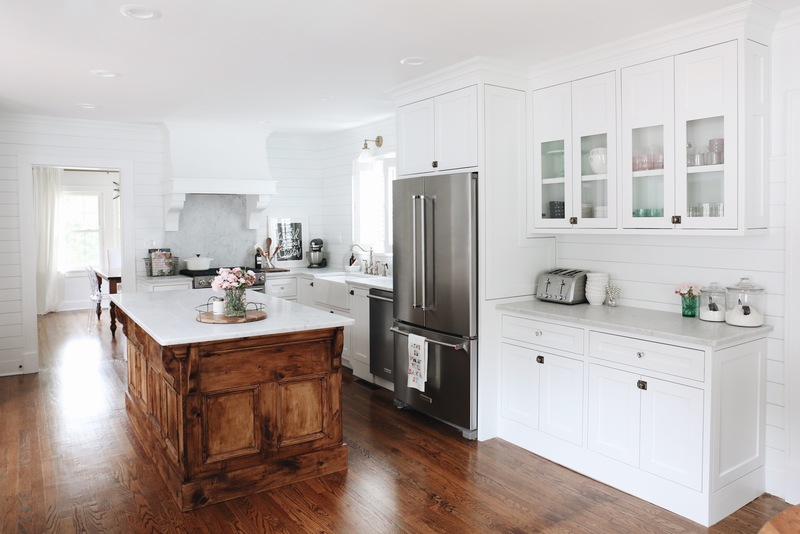 I can’t believe we finally get to share with you the complete kitchen renovation before & after!!!!! I remember standing right here in this kitchen, middle of January, snow falling and just walking around this old house imagining our family here. 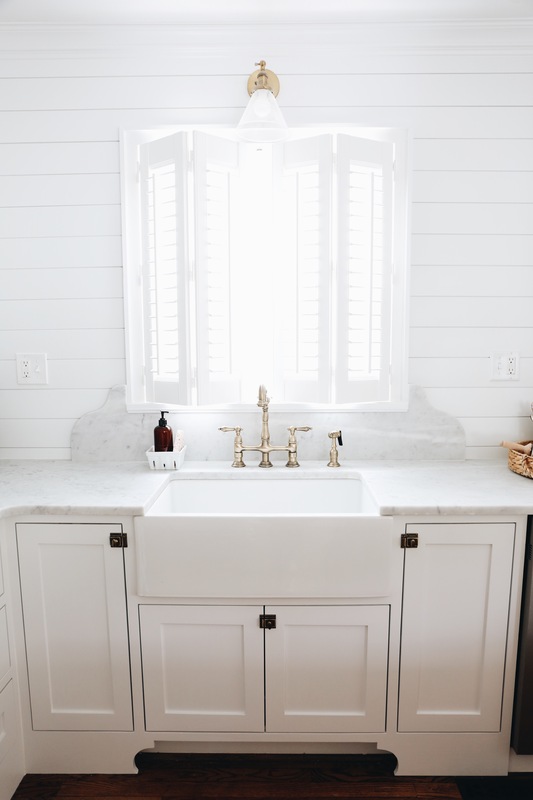 The doorknobs and old built ins totally stole my heart, I could see our exterior painted white with the glass backboard basketball hoop, all the father of the bride vibes. I could picture us cozied up in front of the fireplace in the family room, kids playing in their sunny upstairs playroom & all the backyard hangs under the string lights. The kitchen was going to be our biggest project ever. I twas daunting, but we really could see the possibilities, right from the beginning. The day we moved to Kansas City, we walked into this space half gutted, smelling like paint and dust. We could barely breathe, some of that from the fumes, some of that from the gut feeling of “what have we done.” We lived in a hotel for a week watching our house get destroyed as they did new electrical, then lived with my parents for over a month as they rebuilt the entire thing, and then, for the last three months, we lived here with half of the existing kitchen & through the renovation while we dreamed up all the possibilities of what we wanted to do with this space. We raised the ceilings by taking out the old soffits, we removed lots of upper cabinets for a more open, airy look. 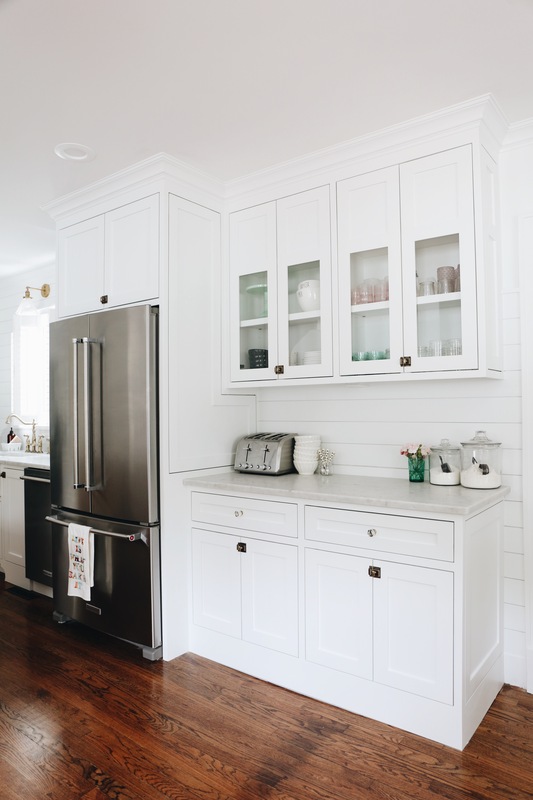 We chose inset shaker cabinets, antique brass fixtures, carrera marble for our countertops, and a little bit of shiplap just for fun. We cannot wait for all the meals, gatherings & holidays in this space!!! 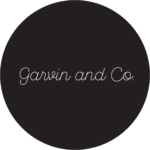 Oh, Garvins! Simply STUNNING. Even that word does not do this space justice! We just went through a HUGE bathroom remodel, also daunting, as you described. I’d love for you to check it out here! Love it! It turned out so beautiful! I’m obsessed with the way the island looks against all of the white! wow! this is absolutely beautiful and classic! love love love!!! So gorgeous! It’s truly stunning. Father of the Bride has been my favorite movie since I was 8 years old and I always told my parents that I would like in that house someday! It’s absolutely stunning! Totally using this as inspiration for our kitchen update. Great job! So dang beautiful. It’s just stunning. Wow, it doesn’t even look like the same kitchen!!! I love all the white, but with just a little of the wood left behind. Absolutely beautiful!!!! Jess!!!! It’s gorgeous!!!! That island!!!!! Looove!!!! Your family is going to be so so happy in that space! Absolutely stunning! 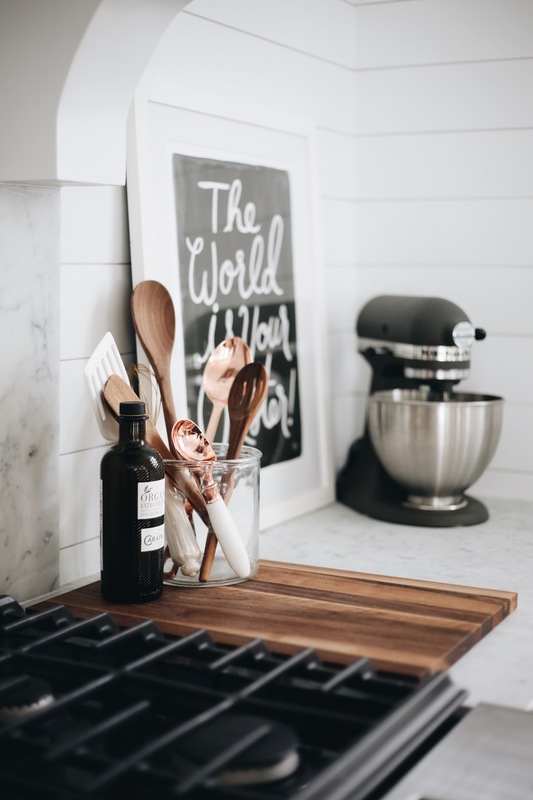 I am smitten with your kitchen redo and FOTB inspiration! 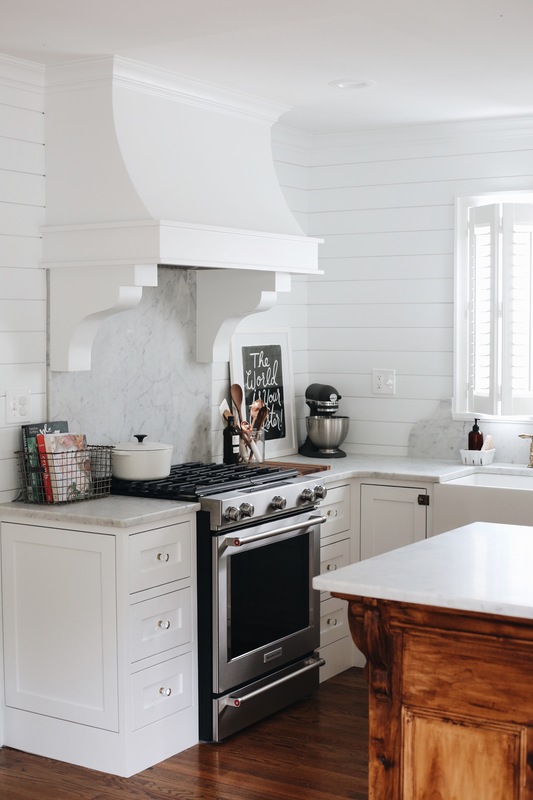 Just wondering the source and wood finish colour of your island, it is absolutely gorgeous! At first I thought it was the original hardwood, but looking at the before and after picture I see it’s new (to you). Can you please share? Thank you! FANTASTIC!!! I want you to come design my kitchen. Actually, my whole house lol! OH MY GOSH! This space is so dreamy! I see Father of the Bride home in all your posts but this! This Kitchen is out of this world! You did amazing and your vision proved right! Congrats on the finally livable kitchen. Many happy memories to come! It came out gorgeous! You must be so thrilled! Now I can’t wait to finish my kitchen Reno!!! Stunning Jessica! What an amazing space, it came together perfectly and stunningly and has your flair! Just gorgeous! 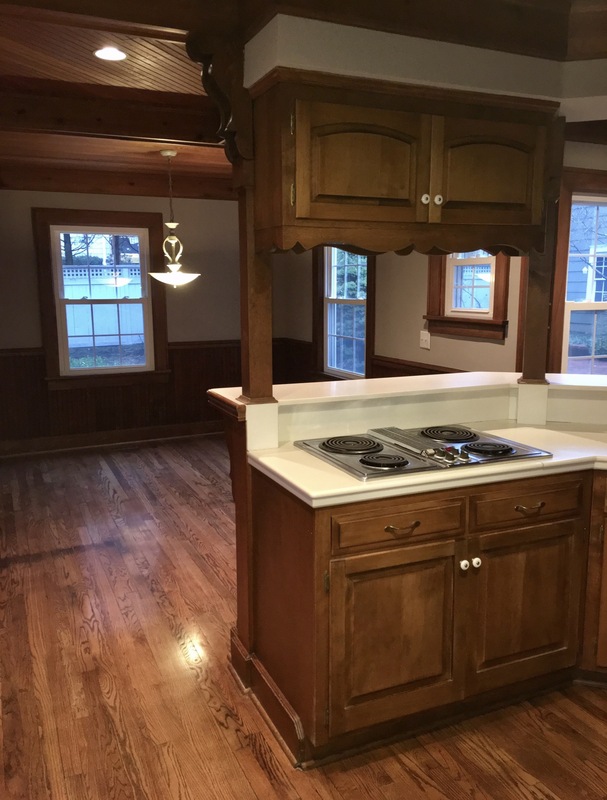 What paint Color did you choose for the cabinets? Chantilly Lace? What color on the walls? What a beautiful Kitchen!!! What paint finish did you use? Eggshell, matte? Can you also tell me more about what wood stain wax you used on the island please? It looks so good! I love the marble. 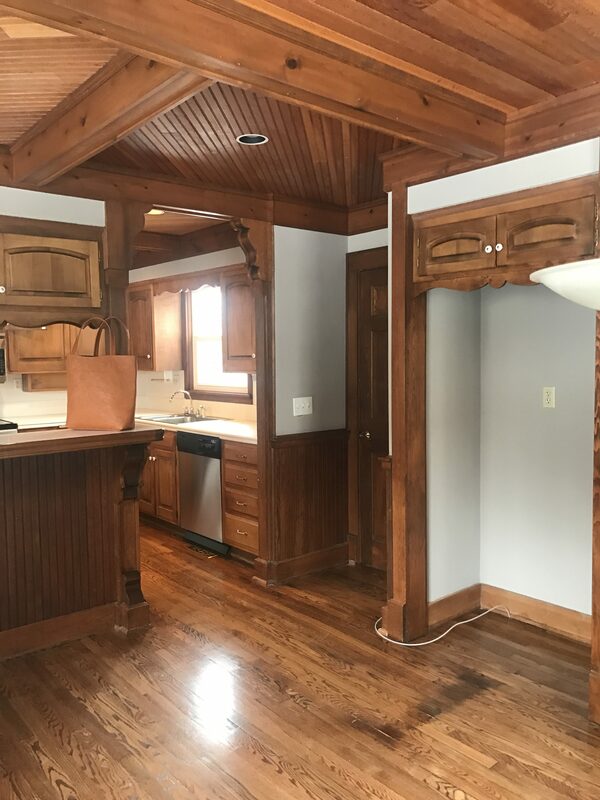 I think the contrast of the warm wood of the island is a nice touch, but is it just the photos or is the stain application really irregular? I feel like I can see the swipe marks and the stain is not applied evenly. I hope it’s either just the photos or you can get it fixed. How is this the same space?!? !🙀🙀🙀 It looks amaze balls!!! Eeek! It looks SO GOOD! I’m so inspired to start my own reno now!!! Your holidays will be so fun in this house!!! So excited for you! It looks SO good! Like a completely different space! Good job! 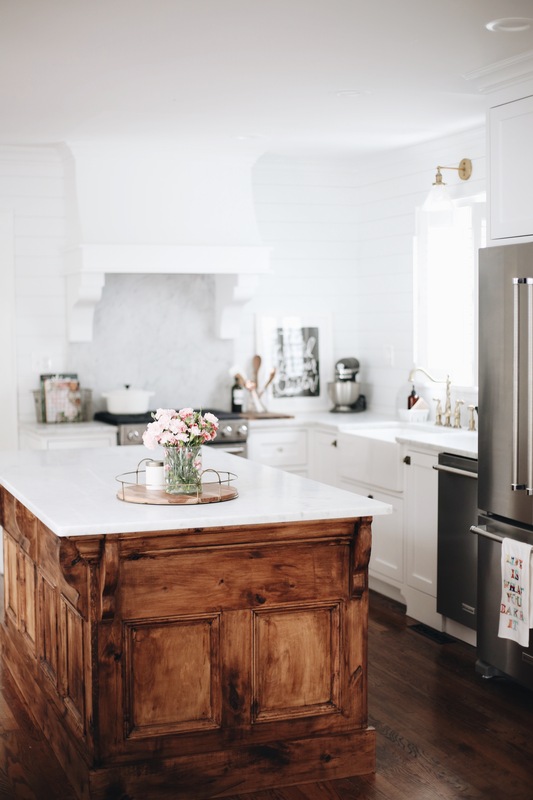 This is one of the dreamiest kitchens I’ve ever seen! LOVE this space! Where did you purchase your island from? We’re getting ready to re-do ours and I love the look of it. Also, what paint color did you use in this house? I have total kitchen envy!! I’d love to see inside your drawers! I am curious how you organized the items without the upper cabinets. I would love to rip out all our upper cabinets too 😊. Looks so beautiful!!!! WOW!! What a beaut! 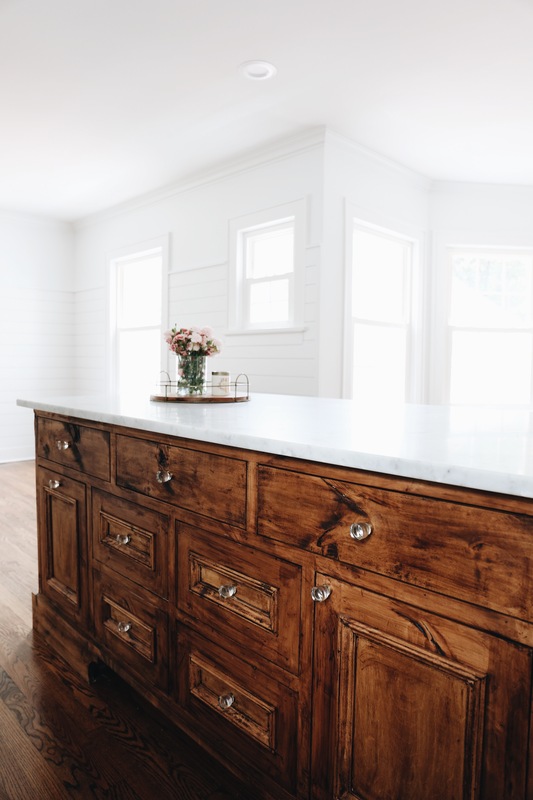 I love the beautiful wood on the island and the crystal knobs, it seems like it really brings a beautiful modern yet traditional element to your home. Congratulations!! I’ve been following your blog since 2012, but this is my first comment. 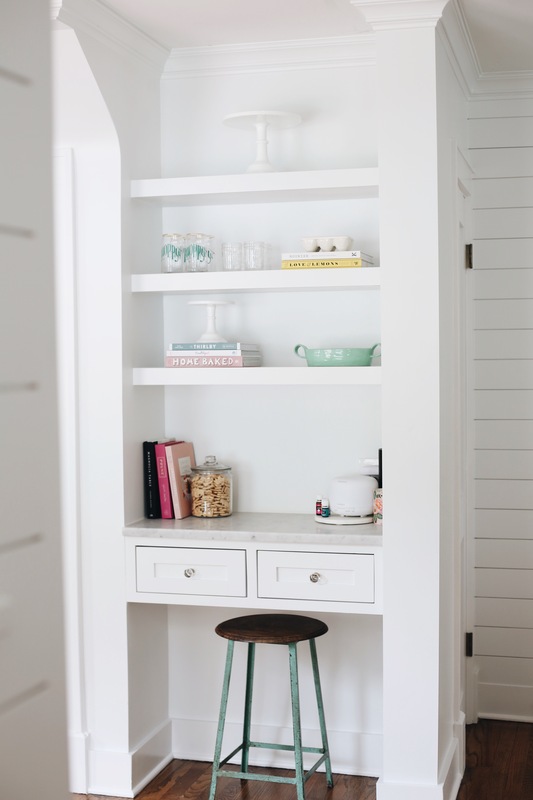 Love your style and incorporation of whites and open spaces into your renovations! 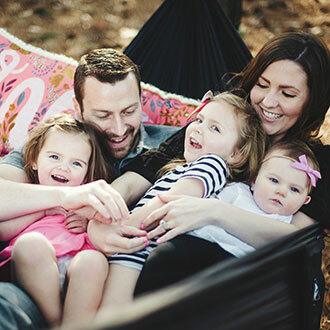 I’ve been using your blog as inspiration for revamping my space and of course, love hearing about your sweet girls. I’m now adding KC to my list of places to visit this year! Stunning! I’ve been waiting to see your before and afters since you announced your new home purchase. 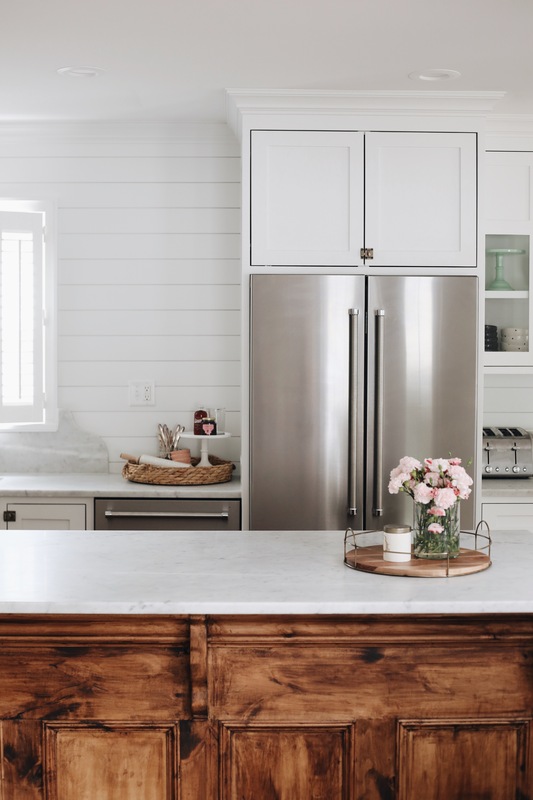 I’m going to be renovating my kitchen in the Spring so I’ve been obsessed with seeing kitchen renos more than I’ve ever been. As always, you did a stunning job with your reno and decor. So happy for your family! OMG it’s absolutely perfect, love it! Absolutely gorgeous!! Love this transformation! SO BEAUTIFUL! What color stain did you use on the island?! Everything is perfect!!!! That island!! 😍😍😍 What color stain did you use? LOVE IT!!! Random question…do you guys not have a microwave? 😉 Not sure if we could survive without one!!! It looks beautiful ❤ would love to see how you organizes without the upper cabinets! Incredible job! And must feel so good to be finished! The island, the hardware and the desk/open shelving area are all to die for. You have great taste!! It’s so beautiful. Fresh, airy, and full of character. All of your styling touches make it absolutely perfect. Congratulations on having all of the hard work behind you. Now, time to sit back and enjoy! Absolutely stunning!!! Love everything about it. It is stunning! You did an amazing job with everything. Happy cooking! 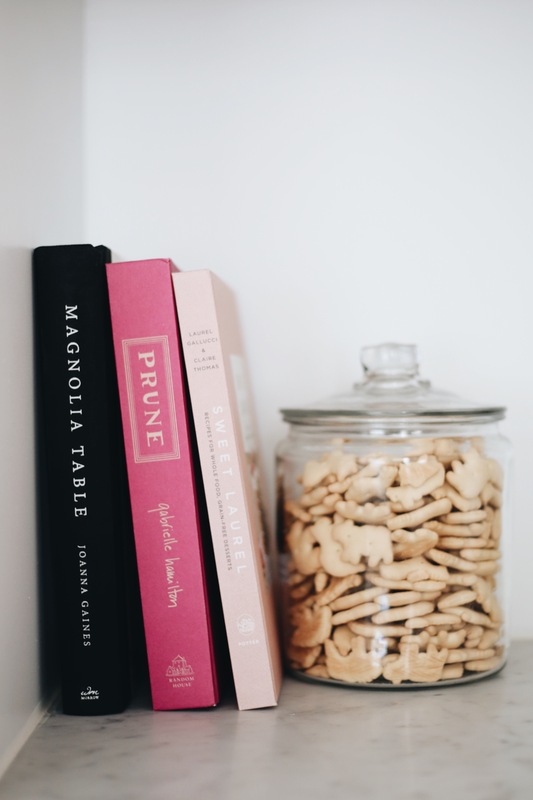 You have no idea how excited I am that you have this done in time for me to move into my house…major inspo for me! Beautiful!!! We are remodeling our kitchen as well and I just love all the details you chose! 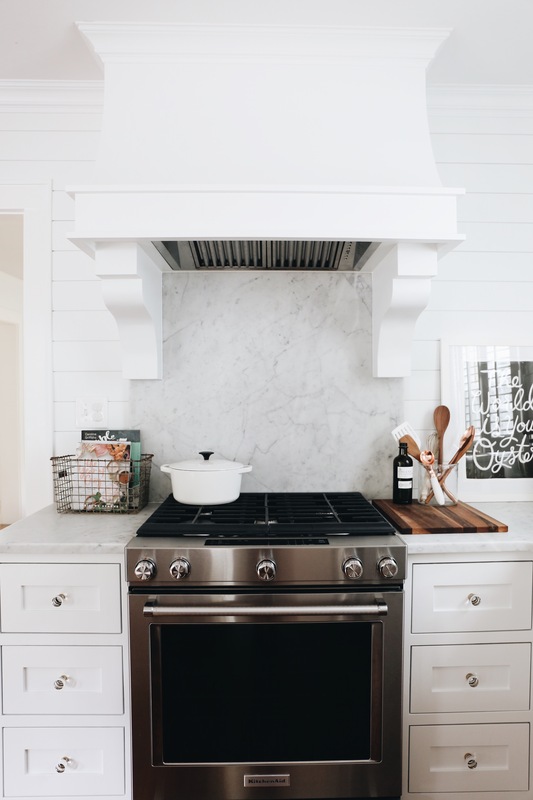 What brand stove/oven is that? Is it a 30” or 36”? LOVING it!!! Beautiful details and finishing choices! Such a drastic change, it doesn’t even look like the same space! Beautiful work, as always! So pretty! Where are your colored glassware from in the glass cabinets? Where did you get the island? I’m searching for someone to build one just like this! Found you from A Beautiful Mess, and I LOVE this kitchen reno! 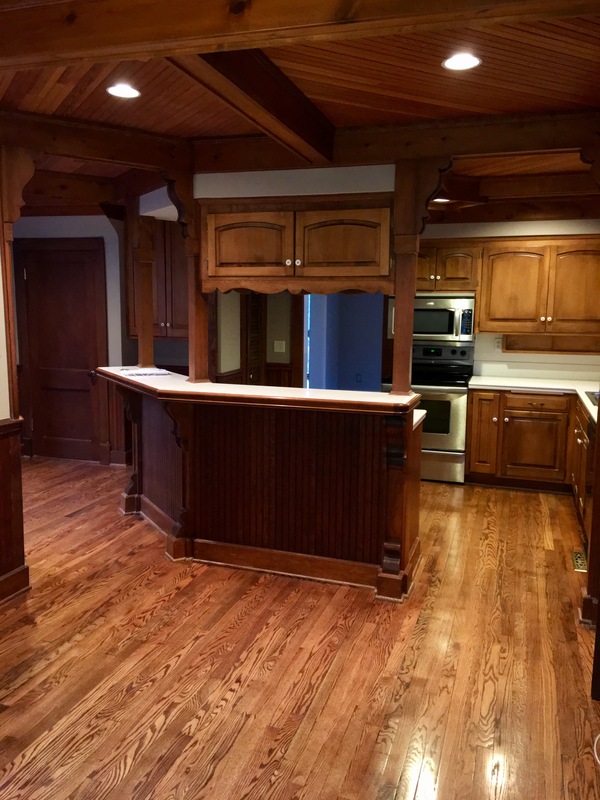 My favorite part is that you kept some dark wood with the island — what a statement piece! LOVE your kitchen!! we will be building a house soon and I am OBSESSED with your style! Where did you get your drinking glasses from, the green and pink glass ones? I have been searching your posts to see if there are any links to them. Also do you just use regular mason jars for your other glasses? Thank you for continuing your blog, I enjoy reading them. Hoping to start mine soon documenting our building adventures!! 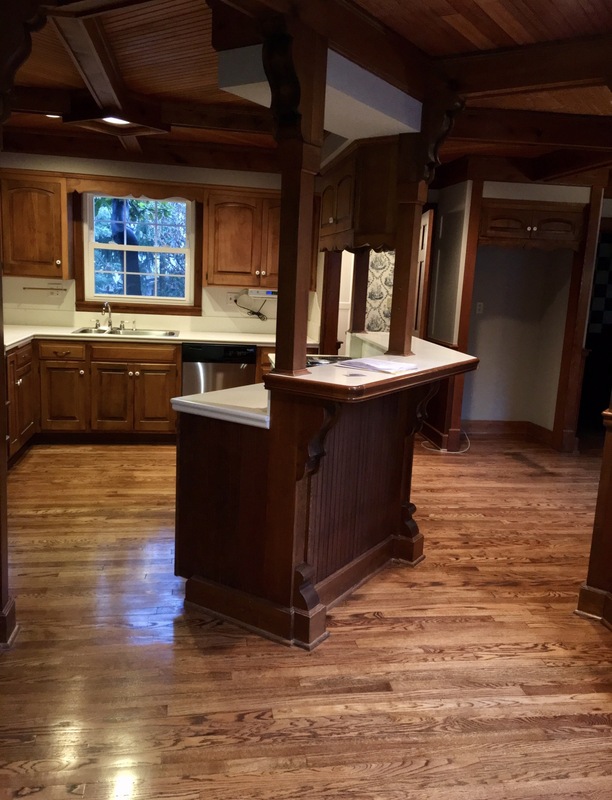 LOVE your kitchen renovation!! I am obsessed with your style. We will be starting to build our house this spring (our subdivision just went through). I am hoping to blog about our adventure building a new home. Do you remember where you bought your drinking glasses? I am pretty sure you use regular mason jars, but the green and pink stained glass looking ones? Thanks so much! Love reading your blog! 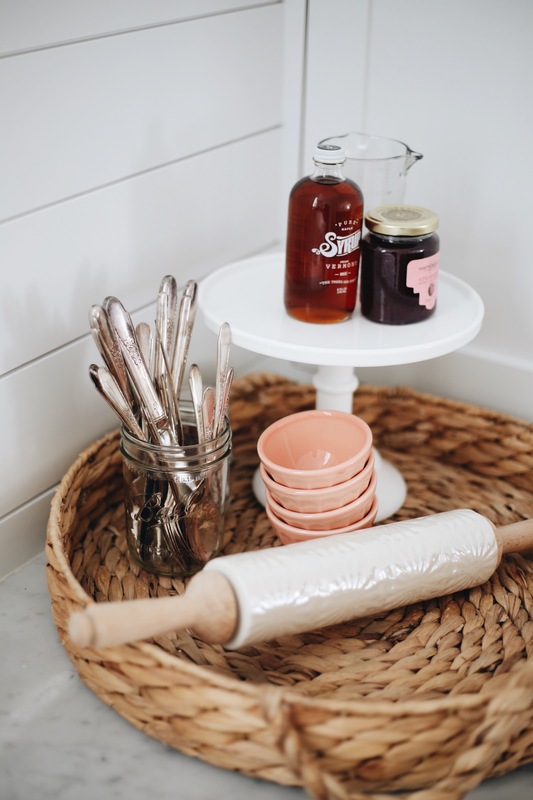 Can you share where that sweet copper whisk is from? Love it! This is just simply amazing- a major transformation! I love all of your design choices – it has all come together so beautifully. You certainly possess incredible vision and talent. Your kitchen is so dang beautiful!! Good job on everything you chose, it’s so perfect!! Love everything about this!!!! Where is the Dutch oven from/ what brand? Do you mind sharing who you worked with? We’re moving to Brookside in KC and will be remodeling an older home. I’d love recommendations for vendors.